This is such a simple treat to make and tastes delicious. 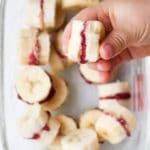 If you haven’t tried frozen banana treats then please take five minutes to prepare this healthy snack. You and your kids will love them, I’m 95% sure of it! Even my husband, who doesn’t really care for bananas, loves these! * I first published this post on Nov 2013 but have updated it with new photos and more information. I first started freezing bananas as a student, they were great for when I craved something sweet. To me, they taste so much more indulgent when frozen and you can get a sweet fix without the guilt. 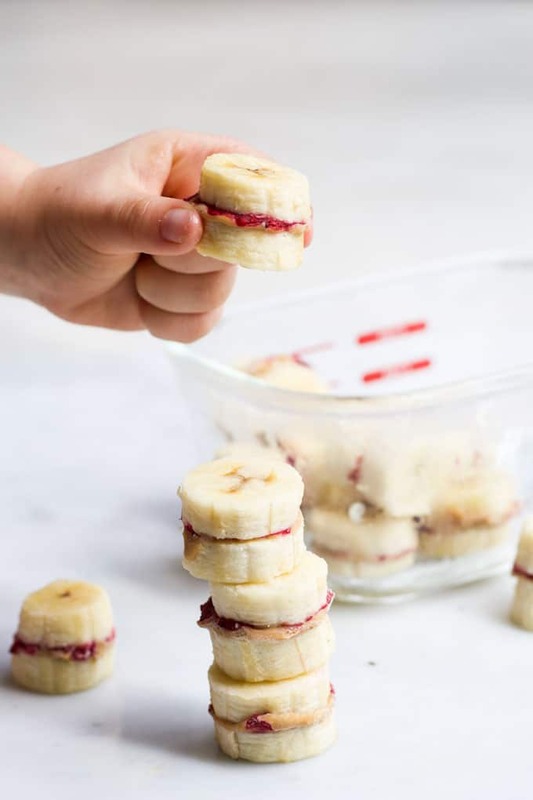 They are so easy to make and you can feel great knowing you are giving your child a treat made with all natural ingredients and no added sugar. You want to make sure your bananas are at prime ripeness. Yellow bananas work best. Green bananas and overripe, brown bananas don’t work as well in this recipe. You want to slice your bananas at around 1.5 – 2 cm thick. If you go too thin they won’t hold together as well. Natural peanut butter and no added sugar chia jam works best for this recipe. 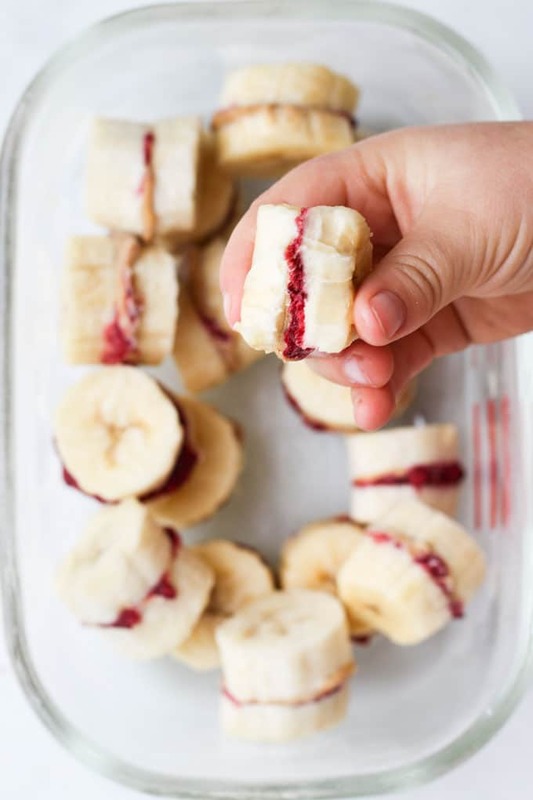 The banana adds plenty sweetness and you don’t need any extra sweetness from peanut butter and jams that are packed with added sugar. 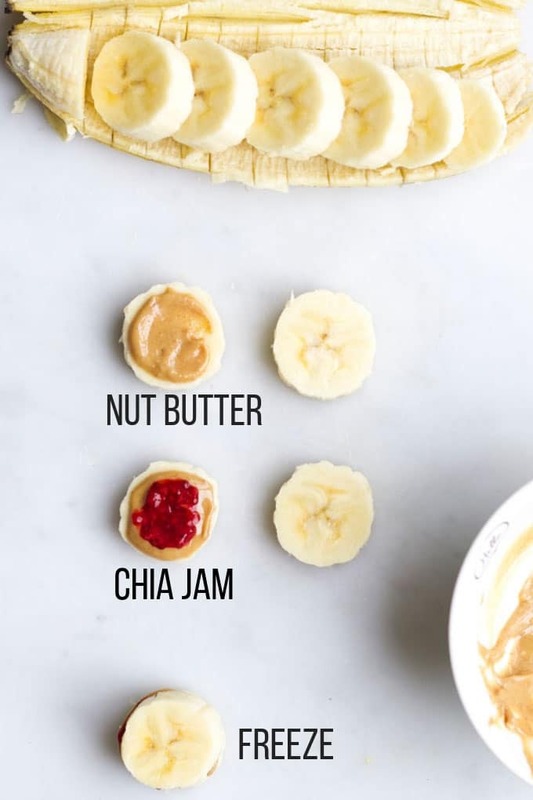 You only want to add a small amount of nut butter and jam (see above picture), if you add too much it will ooze out the side and can get very messy! Freeze until solid, approx. 2 hours, and then transfer to a freezable container/bag. Enjoy these treats straight from the freezer. Properly stored, they will maintain at best quality for 2 to 3 months, but will remain safe beyond that time. Have you tried this recipe? I love receiving your feedback. Please rate and leave a comment below or tag me on Instagram. Natural Peanut Butter and Chia Jam, sandwiched between two banana slices and frozen. A delicious and healthy snack. Peel bananas and slice bananas approx 1.5-2cm thick (1/2 - 3/4 inch) thick. Continue until all the banana is used up. I made 14 but how many you make will depend on the size of your banana and how thick you slice. Line a baking tray with a silicon mat/baking paper and place the banana treats on the tray in a single layer, ensuring the bites to not touch (this stops them from clumping together. Freeze for two hours (or longer) and then transfer to a freezable container. Enjoy straight from the freezer. Make sure your bananas are ripe, green bananas will not work as well. You can replace peanut butter with any nut butter of choice. 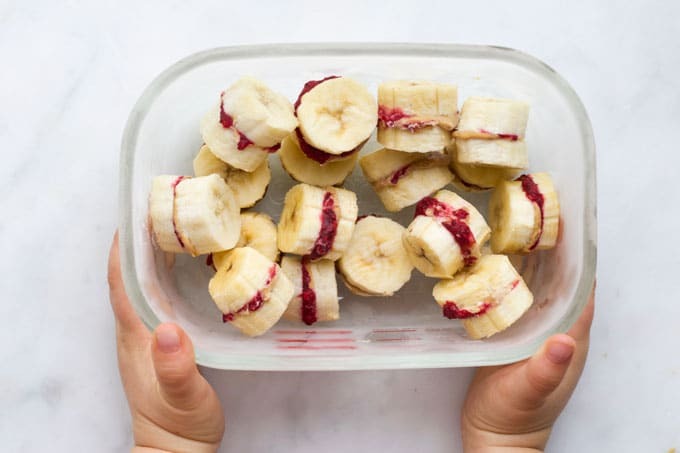 I use 2 ingredient chia jam, it is easy to make and tastes great with the sweetness of the banana. You don't want to add too much nut butter and jam as it will squeeze out and make a mess! See picture above for the amount I added to each slice. Nutritional information is a rough guide only, calculated using an online calculator. Values will vary depending on the size of bananas used, the nut butter brand and chia jam brand/recipe. I made these after seeing them on your Instagram. I just used peanut butter as I didn’t have any chia jam. I can’t believe how good they are, I actually ate more than the kids. I’ll be making them again for sure. I freeze bananas for smoothies, and they always turn brown. What’s the trick to keeping them looking good in the freezer? I would love to make these! Hi Amanda, I freeze on a tray and then transfer to an airtight glass container. It has a vent on the lid that allows you to push down and then close to remain airtight. I have frozen them in bags before but they definitely don’t last as long.